Presentation. It matters. A lot. It fuels first impressions and—when done well—can help us convert prospects into paying customers. Over time, the dynamic delivery and presentation of content across all customer touch points can engender loyalty. Automating the presentation of content and providing for its dynamic delivery requires the separation of content from its formatting information. It requires structured, modular, semantically rich intelligent content and a delivery platform designed to tackle the job. 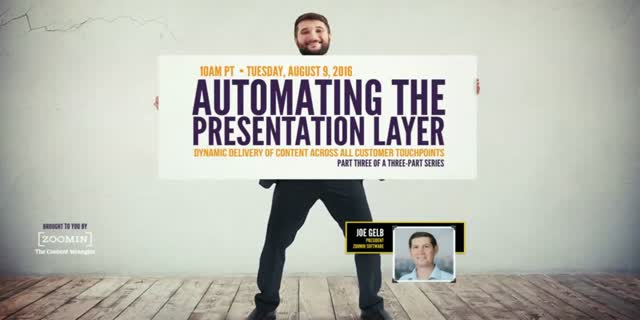 On Tuesday, August 9, 2016, join Scott Abel, The Content Wrangler, and intelligent content guru, Joe Gelb, President of Zoomin Software, for part three of a three-part webinar series on content delivery. You’ll learn what dynamic content delivery is, how it works, and why you need a platform designed to automate content presentation. You’ll discover how separating content from its formatting information allows you to automatically control how it's presented to those who need it on the device of their choosing. You’ll find out how controlling presentation can turn prospects into customers and provide exceptional content experiences for all.